Wild donkeys, also known as asses, were first domesticated over 5,000 years ago in the Middle East. 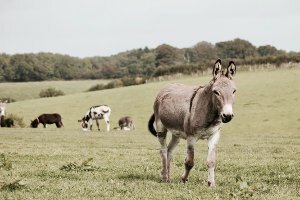 Ethiopia leads the list of countries with the most donkeys with over 7 million head, followed by China, Pakistan, and Mexico. Pakistan is planning to grow its population for export to China. India ranks #25 in the world with 300,000 donkeys. See the complete list below. This data, and much more great information, is available from the Food and Agriculture Organization of the United Nations. Donkeys are closely related to horses, and breeding donkeys with horses produces the sturdy mule.